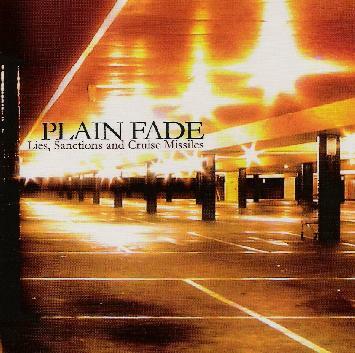 Plain Fade - "Lies, Sanctions and Cruise Missiles"
With a CD title like this you would expect the band to come from the US or the UK. But no, Finland! The words in the middle of the CD booklet are for the thinking man and pretty heavy if you interpret them the way that I did. Ok... the music. There are 6 trips on this CD. Four long (over 7 min) and two short (under 4 min). The CD begins with "Weapons of Mass Destruction", a slow building track that reminds me very much of the dreamy moods created by Godspeed you Earth Black Emperor. The band make good use of samples in their music and also great dynamics. "Blue Skies Ahead" starts as a dreamy new age type track after the intense ending of the first track. "Chips Falling Where They May" and "Cerebellum" have some nice delay guitar and some lofty-airy vocals that give the music a bit of a commercial feel. The CD ends with the title track and this is the best track on the CD as well, with a lot of different moods expressed. For more information you can visit the Plain Fade web site at: http://www.plainfade.com. Visit the Punos Sound web site at: http://www.punosound.net.